You no doubt are aware that our nation is experiencing an epidemic of religious hate crimes. This is neither the time nor the place to pour more hatred on to a public already saturated with the bitter hatreds of the demented few. I recently saw another clip on A&E indicating that you still air Leah Remini’s bigoted show attacking Scientology. This is both insensitive and irresponsible. Our Church has received more than 100 threats since her program was aired, including death threats and a bomb threat. Evacuations of seven Jewish Community Centers (JCCs) following anti-Semitic bomb threats. Desecration of a Catholic Church and a Japanese Christian Church in West Covina in Greater Los Angeles this past weekend. Leah Remini’s only interest is in creating religious hatred to swell her own pockets. She’s a professional bigot on A&E’s payroll, producing a vindictive, one-sided series that never for a moment sought balance. A&E should be ashamed for further fanning the flames of religious intolerance and undermining one of our great freedoms we enjoy. 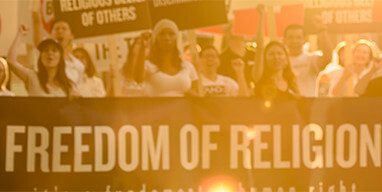 The United States Department of Justice doesn’t define religious freedom as “Protecting the Religious Freedom of All, Except Scientologists.” It states, “Protecting the Religious Freedom of All.” It is all-inclusive because that is the overriding principle at the heart of our democracy. Bigotry of any kind has no place in our society.